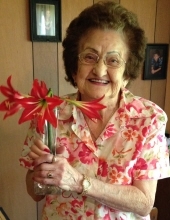 Mary Wilson, 90, went to be with her Lord on March 21, 2019 in Pasadena, Texas. She was born on January 5, 1929 to parents Martin and Rosaura Najera, Sr. in Galena Park, Texas. Mary moved to Houston in 2003, and retired from Saint John’s Hospital after 11 years of dedicated employment. She liked butterflies and flowers, and especially loved having gatherings with all her loving family members. Mary is preceded in death by her parents. She is lovingly survived by her children; Dorris Maggio, Tommy Houston, Sylvia Wilson, and Mary Lee Wilson, as well as numerous extended family members and friends. Celebration of Life services are pending at this time in Houston, Texas, as well as in Tulsa, Oklahoma. To send flowers or a remembrance gift to the family of Mary Wilson, please visit our Tribute Store. "Email Address" would like to share the life celebration of Mary Wilson. Click on the "link" to go to share a favorite memory or leave a condolence message for the family.